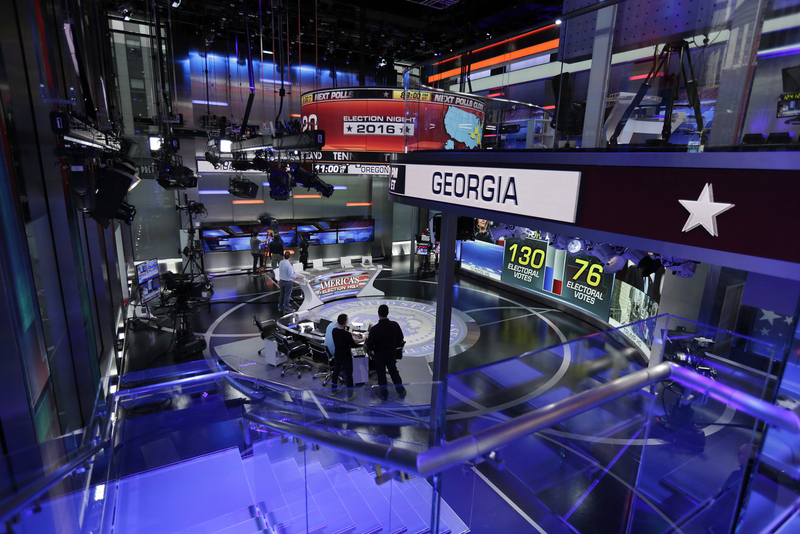 Celebrating its 20th anniversary, Fox News has taken the wraps off its much anticipated two-story streetside studio that has been designed as a glittering homage to the newsgathering process in the heart of downtown New York City. 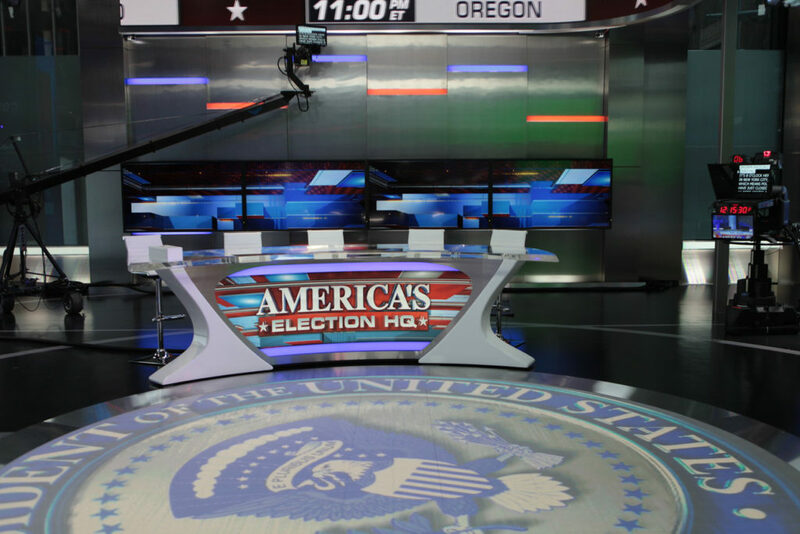 “Our two-level 6th Avenue studio is home to FNC’s 2016 Election coverage, which features display technology and scenic capabilities unrivaled in the industry. This new state-of-the-art technology will enhance our programming for many years to come,” said Warren Vandeveer, SVP of engineering and operations at Fox News. The new studio, christened Studio F, occupies the streetside space that was once a FedEx Office store at the corner 47th Street and 6th Avenue, also known as the Avenue of Americas, and it provides sweeping views of the facade of the News Corp. building and neighboring courtyard, as well as views up 6th Avenue past Radio City Music Hall and toward Central Park. 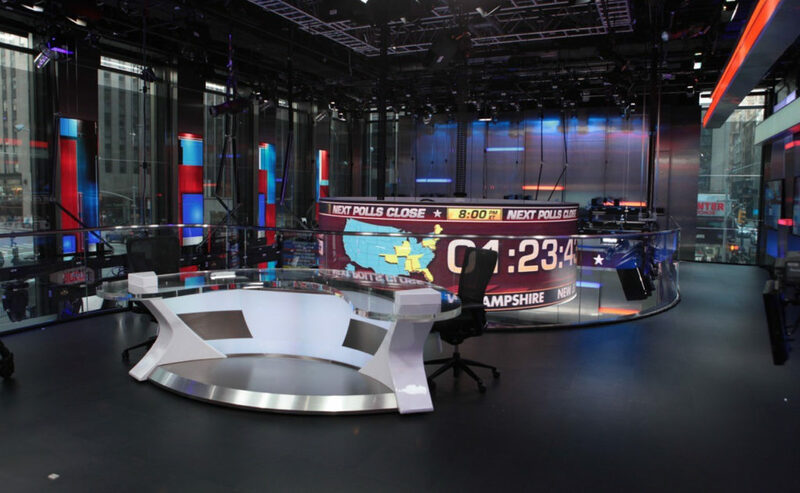 “The studio was really an opportunity to make a bigger statement for Fox News in New York City, only a block from Times Square,” said Jim Fenhagen, EVP of design at Jack Morton PDG. The zenith of the new studio is a piece dubbed the “video chandelier” — a 14-foot diameter ring of LEDs that is mounted on intricate hoisting systems that allow it to be raised and lowered anywhere between the floor and the 30-foot ceilings in the space, with the displays powered by Vizrt. The chandelier, which is created from NanoLumens’ NanoWrap panels with a 3mm pitch, is perfectly aligned with a circular video screen embedded in the floor, upon which the talent can walk. Video chandelier in Studio F. Photos courtesy of Fox News. The flowing shape of the chandelier is mirrored in the Leyard 1.6mm 32×9-foot video wall tucked under the balcony, which itself is fronted with a curved video ribbon. The balcony makes a strong architectural statement by wrapping around the vertical space of the video chandelier, creating a striking contrast in the otherwise rectangular space. Above, on the second floor, is an additional anchor location which can use the backdrop of either the street view or, when positioned halfway down, the video chandelier. This space also includes an interactive touchscreen that is tied to the mezzanine level’s larger 21-foot Leyard video wall, allowing talent to virtually move imagery, through a bit of TV magic, from the touchscreen to the other sections of video wall. The second floor is accessed through a sculptural glass stairway and will eventually feature a glass box elevator. The staircase is backed with a nearly 30-foot tall video tower comprised of panels, giving the network unique storytelling opportunities when used in conjunction with the stairs. 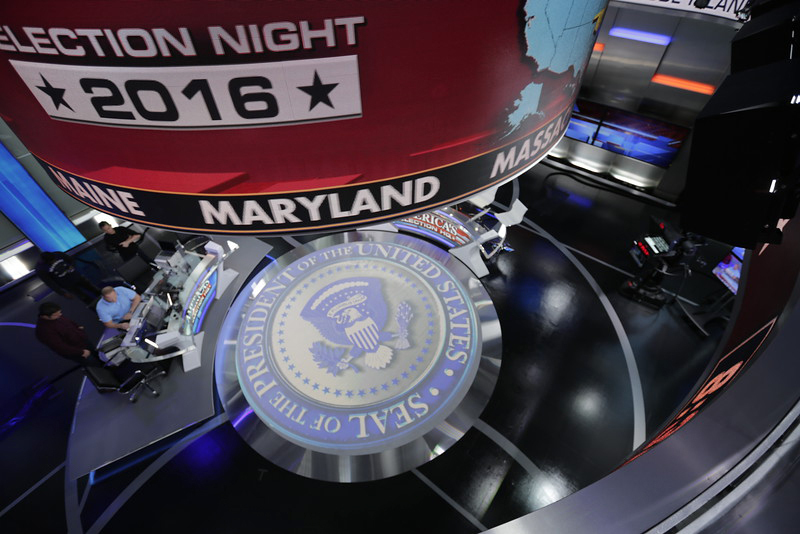 Down on the main floor, which is fully visible from the sidewalk, are two additional anchor desks that can accommodate a variety of seating configurations and can be moved around the space for any number of shooting options, with Fox News making full use of them for its election night coverage.